A question from Richard Auffrey in Stoneham, Massachusetts, got me thinking. He said "I recently purchased a few bottles of the 2004 Kanonkop Estate Pinotage. I am very much of fan of Pinotage. I read your blog, the Pinotage Club, and saw your post of 8 May. 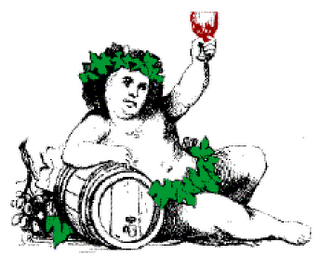 You stated that Kanonkop Pinotages need bottle aging and should not be drank until they are ten years old. Would that apply to the 2004 as well?" I checked through my records (thank you CellarTracker) and saw that, although I had tasted Kanonkop 04 on several occasions, I hadn't sat down and enjoyed a leisurely bottle with a meal. The wine is very dark, indeed opaque black with a dark red rim. The immediate impression on the nose and palate is of bright berry fruits. (We’ve recently been blackberrying and this wine brought back memories). You wouldn't know that the wine has spent 16 months in small new French oak barriques because the tannins were very soft and integrated. Over the course of dinner the wine opened up, revealing layers of flavour under the initial bramble berries like a exotic dancer discarding veils. There was coffee, dark chocolate and black pepper. Later tobacco leaf and then a little smoky bacon developed on the finish. This was drinking very nicely now but I’m going to keep some back and I look forward to seeing how they age in bottle. So there you go, Richard. Drink now with pleasure, but be sure to retain some -- for this wine has a lot going for it. And thanks for the nudge to open this super wine. The stickers are Veritas 2006 Double Gold and 2006 Pinotage Top 10 winner. Thanks very much Peter for all your help with my question. Based on your enticing tasting note, I certainly will open a bottle of my 2004 Kanonkop very soon. I will also keep a couple of bottles to age for a time, so I can track its progress over time. Long live Pinotage! 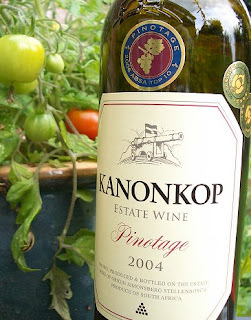 Pete - I got my hands on three bottles of Kanonkop Pinotage 1998 from posh hotel - who were clearing out their cellar! What a steal - will post some tasting notes soon - I doubt I'll be able to resist opening one that much longer!